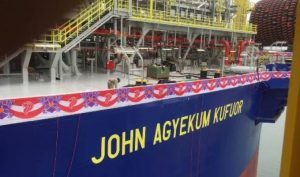 The new Floating Production Storage and Offloading (FPSO) vessel, John Agyekum Kufuor, has safely arrived in the country’s waters. It is currently being moored on top of wells at the Tano Basin Offshore Cape Three Points (OCTP). 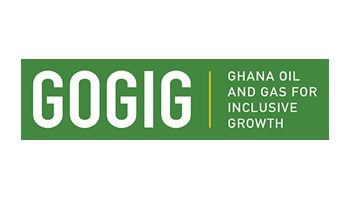 The arrival of the FPSO marked the final stage of the development of Ghana’s third independent oilfield in a joint venture operation which has the Italian oil giant, ENI, as the lead operator with a 44.44 per cent interest. 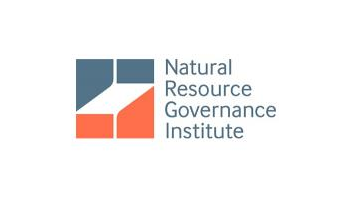 The other partners are Vitol, with 35.56 per cent, and the people of Ghana, represented by the Ghana National Petroleum Corporation (GNPC), with 20 per cent. The arrival of the FPSO brings optimism to the energy sector, as it is expected to help produce an additional one million standard cubic feet of natural gas for the country’s power sector. Ghana’s daily oil production is expected to go beyond 240,000 barrels per day by the time the three independent fields hit apex production. At present, the Jubilee Field is producing more than 100,000 barrels out of the expected production of 120,000 barrels, while the TEN Fields, some of whose wells are not yet active, are doing 56,000 out of the expected 80,000 barrels per day. The third field, the Sankofa Gye Nyame block in the OCTP, which is expected to pour its first oil in June this year, instead of August, will also produce 45,000 barrels per day at its peak. With the additional benefits of gas for thermal power, the country is likely to be almost self-sufficient in energy production, as an estimated 500mmscf will be aggregated for the power sector, subject to the expansion of the Atuabo Gas processing plant. At its peak, ENI OCTP gas alone is likely to deliver more than 200mmscf, instead of the projected 180mmscf. In addition to power generation, Jubilee and TEN gases are expected to augment the domestic liquefied petroleum gas (LPG) needs to save the country the importation of LPG. The FPSO Kufuor, built in Singapore by Keppel Shipyard Limited (KSL), was named after former President Kufuor, under whose tenure oil was found in commercial quantities in 2007. The FPSO, which is 300m (985ft) long, has a storage capacity of 1.7 million barrels, a double hull to reduce environmental risks and a treatment capacity of 58,000 oil barrels per day. It also has a gas injection capacity of 150mmscfd, a maximum future gas export capacity of 210mmscfd and condensates. The FPSO Kufuor’s 17 topside modules are dedicated to oil and gas treatment, which were successfully installed on board. The project, according to the lead operator, ENI Ghana, complied with the highest environmental standards and has a complete in-field re-injection of the associated gas. The multi-million-dollar project, which passes as one of the critical equipment for the energy sector, includes 18 subsea wells, which have already been perforated for both oil and gas. The FPSO contract is for 15 years, with five yearly extension options exercisable by Eni Ghana. 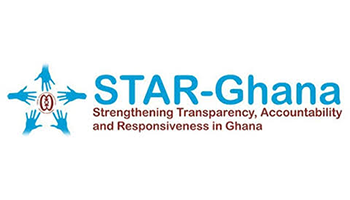 Prior to the arrival, the government regulator for the upstream petroleum industry, the Petroleum Commission (PC), engaged stakeholders in the six coastal fishing communities of the Western Region. 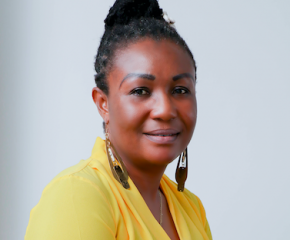 The team, led by the PC’s Community Relations Manager, Mrs Judith Adjobah Blay, pledged that all necessary safety rules would be applied as the vessel was moored for the final hook-ups for first oil in June 2017.